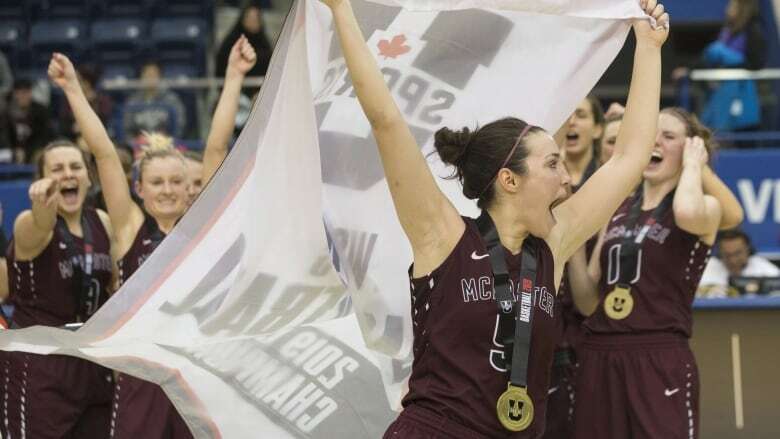 The McMaster Marauders have captured their first Bronze Baby. Sarah Gates and Linnaea Harper scored 18 points apiece as the second-seeded Marauders upset No. 1 seed Laval Rouge et Or 70-58 to win the U Sports women's basketball title on Sunday. In the early days of her 26th season, coach Theresa Burns quietly wondered. Could this be the year? The veteran McMaster women's basketball coach believed all season that there was something special about this year's team. And on Sunday, the Marauders rewarded their coach with the program's first-ever Bronze Baby. Finally. Sarah Gates and Linnaea Harper scored 18 points apiece as the second-seeded Marauders upset No. 1 seed Laval Rouge et Or 70-58 to capture the U Sports women's basketball title on Sunday, in their first-ever appearance in the gold-medal game. "There are some years where you just have a good group and you think, 'Wow, maybe this is the team,"' Burns said through a wide smile. "We just knew that this team had something different. "Just unbelievable. I-can't-even-describe-it joy. Unbelievable pride in this group." Harper captured tournament MVP honours for her performance. And when Burns, who won a national title as a player in 1986 with the University of Toronto, crossed the court to receive her gold medal, her players chanted "M-V-P!" "As a player, you put so much work into it, but as a coach, I think there's a different level of understanding of how hard it is and how special it is," Burns said. "As a player, your coaches and your teammates lead you there and it's hard but you go where they tell you. As a coach to go through all this, it's unbelievably difficult." 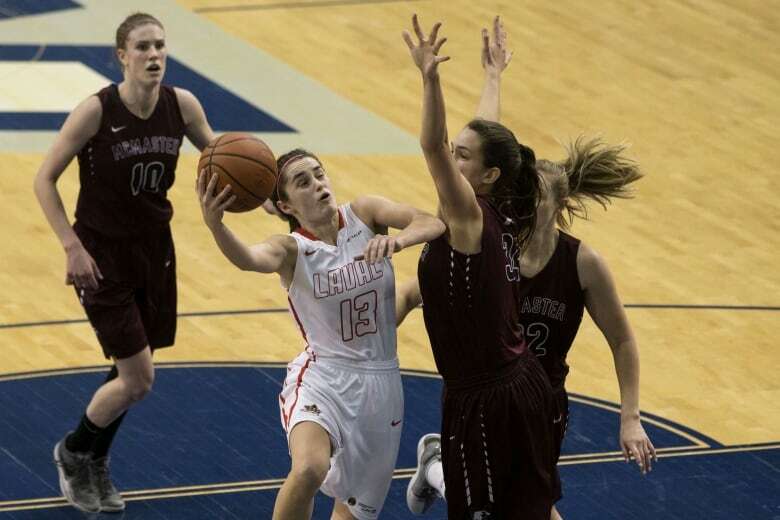 Sarah-Jane Marois, who earlier in the week won the Nan Copp Award as player of the year, led Laval with 21 points. The Marauders had dispatched Saskatchewan in the semifinals to earn their berth in the final, while Laval, the silver medallists in the 2017 national tournament, topped Ottawa. Both programs had remarkable seasons. Laval went 17-1 through the regular-season and playoffs, while McMaster went 24-3, upsetting Ottawa to win the Ontario conference championship. Sunday morning, before they tipped off in what for many of them would be the biggest moment of their sports careers, Burns told them to have fun. "That was our message last night and this morning and at halftime and in the timeouts," the coach said. "Just keep having fun out there and enjoy the moment. No matter what happens, this is amazing. You need to soak it up and enjoy the moment." That message was big, McMaster's Christina Buttenham said. "Playing in the national finals there's so much pressure, but having a coach like her who's so calm in big games like this definitely helps calm your nerves too." McMaster capitalized on Laval's poor shooting performance — the Rouge et Or shot just 29.6 per cent on the night. And the Marauders pestered their opponents into 18 turnovers. The teams went into the fourth quarter tied 44-44, but the Marauders weren't concerned. "This team is so resilient and we sat on the bench and we never got down, they picked each other up and they still really believed," Burns said. "As soon as we flipped the switch defensively and got back to the way we can play D, it started to turn the tide a little bit." McMaster led 11-10 after a sloppy first quarter for both teams. The Rouge et Or found their shot in the second and when Marois connected on back-to-back threes, Laval went up by seven points. The Rouge et Or took a 33-27 lead into the halftime break. Laval's shooting went ice cold in the third — just 11 per cent from the field — and McMaster tied it up with one quarter left. Laval battled back to within a point, but Gates answered with two big baskets to give the Marauders a four-point lead with three-and-a-half minutes to play. It was virtually all McMaster the rest of the way. And when Harper scored with 1:20 to play, the crowd erupted in a roar, and the Marauders went ahead by 10 points. The celebration was on. "It feels like a dream," Harper said. "I can't believe we won the national championship. Unbelievable, to be able to do this after five years, in my last year, it's so amazing. "And I'm sure this means the world to coach. She's been doing this more than 25 years, so to finally make it to the national championship game, and win it for her is so huge." The gold-medal matchup was virtually a home game for the Marauders. Hundreds of McMaster fans, with maroon and white scarves looped around their necks, made the trip up from Hamilton to pack the MAC. An announced crowd of 1,684 took in the game at the 2,800-seat Mattamy Athletic Centre, normally home to Ryerson University. Several current and retired national team players sat courtside including WNBA stars Kia Nurse (whose mom Cathy played for McMaster) and Natalie Achonwa, and retired national team players Lizanne Murphy and Tamara and Alicia Tatham. The Ottawa Gee-Gees won bronze earlier in the day, roaring back from a 19-point first-half deficit to beat the Saskatchewan Huskies 63-62. Sarah Besselink scored 13 points for No. 4 Ottawa. Sabine Dukate had 15 points for third-seeded Saskatchewan, while Summer Masikewich had 14 points and 13 rebounds. Saskatchewan raced out to a 19-12 lead to end the first quarter, then went ahead by 19 in the second before taking a 41-27 advantage into the halftime break. But Ottawa battled back in the third, and took a 48-47 lead into the fourth quarter. The Gee-Gees went up by seven points in the fourth before Dukate connected from three-point range to pull Saskatchewan to within a point twice in the final three minutes. A shot by Masikewich bounced off the rim at the final buzzer.